Dr. Niaz Ahmed Khan F.R.C.S., PhD. 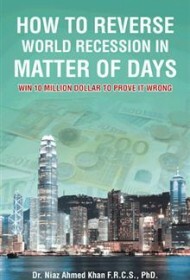 Though its gramatically incorrect title might be off-putting to many, Dr. Niaz Ahmed Khan puts forth some bold and provocative, if idealistic, ideas in How to Reverse World Recession in Matter of Days. Khan claims that this system would be attractive to the public, because they would pay a higher price for goods and services without buying bonds than they would by purchasing bonds and using them to pay. Khan’s idea, which he claims would allow interest-free banking and a reduction of unemployment, is intriguing. But as he notes, “MBCS requires the wholehearted endorsement of the Government of USA […]”; in the current political environment, it’s difficult to believe that such a drastically new system could gain the necessary support. Also, while Kahn’s system seems fundamentally workable, it relies on optimistic predictions that assume perfect and rational behavior from consumers. Ultimately, his plan seems overly optimistic to be practical in today’s world. Nonetheless, it’s a noble effort to seek economic improvement for the U.S. and the world.